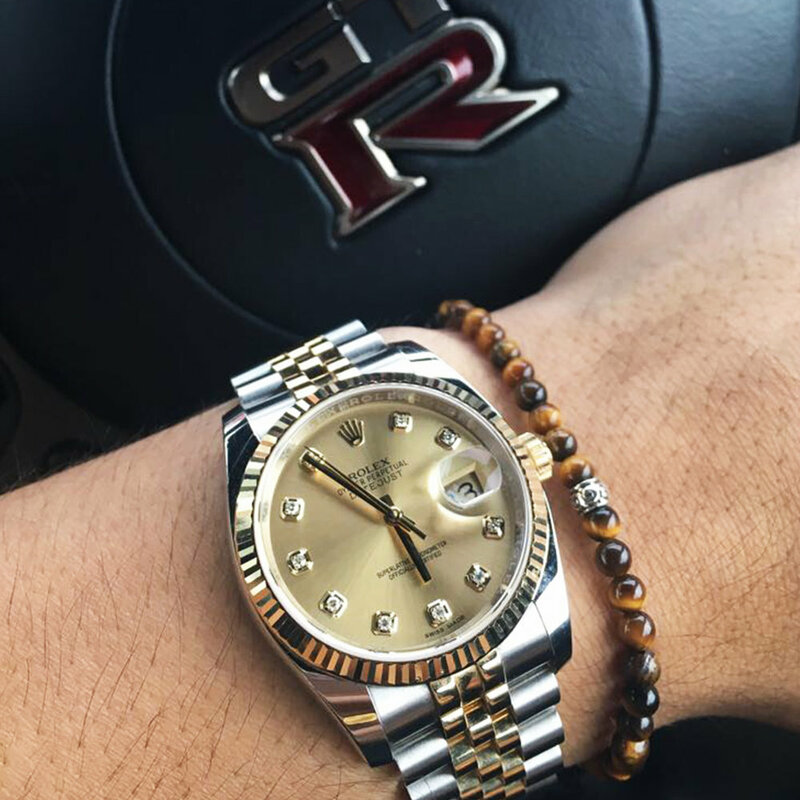 A bracelet is the easiest piece of jewellery for the modern gentleman to put on and successfully pull off. Whether you're looking for a subtle sartorial detail, a bold statement piece, or a stylish stack, you're sure to find something from our collection of handcrafted bracelets. – as well as a helping hand on how to wear it. We've put together an essential guide to wearing our leather & beaded bracelets. Beaded bracelets make a definite statement. Our handmade beaded bracelets are versatile enough to adapt to a wide variety of looks. With a formal suit, go monochrome and minimal, while casual attire requires colour and texture, drawing on colours from your outfit to make the bracelets pop. Although they can be worn individually to inject colour into your look, the idea is to stack a variety of bracelets together to create a look that is your own. Our beaded bracelets are handcrafted using the finest semi-precious gemstones and finished with solid silver detailing. We offer our beaded bracelets in a variety of colours and styles. A leather bracelet is a classic option which signifies refined masculinity. 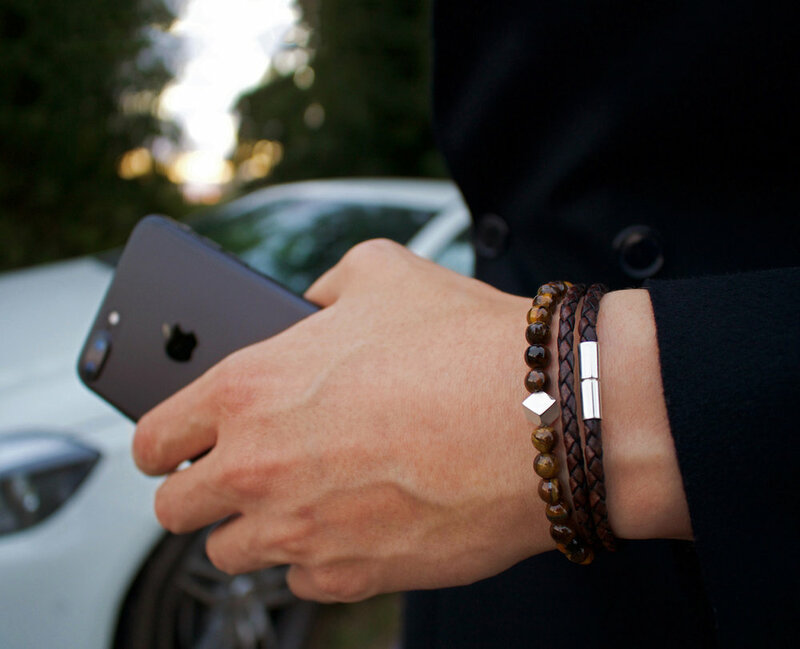 A well-placed leather bracelet can bring a little understated texture to your outfit, whether formal or casual. Our handcrafted leather bracelets are made using the finest materials and finished with a solid silver bayonet clasp for a secure and comfortable fastening. While our leather bracelets work well by themselves, try mixing them with our beaded bracelets for a textured approach to your wrist wear. Pictured below, our Aegean Braided Leather Bracelet pairs elegantly with our Deep Blue 4mm Bracelet and Atlantic 'Signature' Skull Bracelet. Our leather bracelets can also complement and contrast nicely against your wrist watch. Stacking bracelets is the name of the game when it comes to men's accessories. Our bracelets are the great way to express personality and individuality. We recommend stacking a combination of bracelets together to create a unique look that is truly your own. Or, make a statement by wearing a single beaded or leather bracelet in a bold colour. For example, our Turquoise 4mm Bracelet packs enough of a punch to be worn on it's own. If you wear a watch, we recommend pairing your bracelet accordingly. For example, if you have a brown leather watch strap, our Chocolate Braided Leather Bracelet would make a fine pairing. Or, you can pair your bracelet to the colour of your watches' bezel. Pictured below, a customer's Rolex Submariner 'Hulk' pairs remarkably with our Malachite Gold Cube Bracelet.